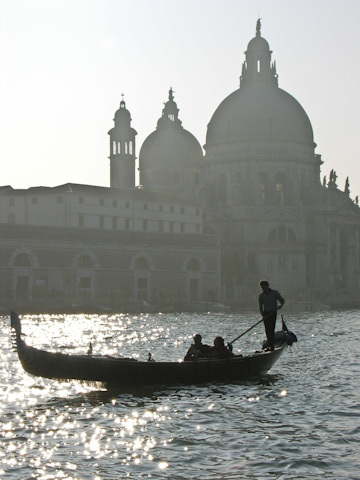 A gondolier in the Grand Canal in front of Santa Maria della Salute. Long, sleek, black, slightly crooked, looking like a cross between a canoe and a coffin, the single oar worked by a professional gondoliere. That's the Venetian gondola, the primary form of transportation in Venice from the 12th century until speedboats roared into the canals in the late 20th. And touristy or not, your visit to Venice isn't complete until you take one of these time-honored water taxis for a spin. Technically the gondola is a mode of transportation, and technically you might find a gondolier willing to ferry you from point A to point B, but in practice these most famous of Venetian boats operate as supremely overpriced tourist mini-cruises, not as a viable means of public transportation. I know you'll take ride in one anyway, but it won't be to get anywhere. (There are gondola-like boats that do still serve as public transport; they're called traghetti and eight of them cross the Grand Canal for €2 a ride). How long does a gondola ride last? The average gondola ride lasts 40 minutes. 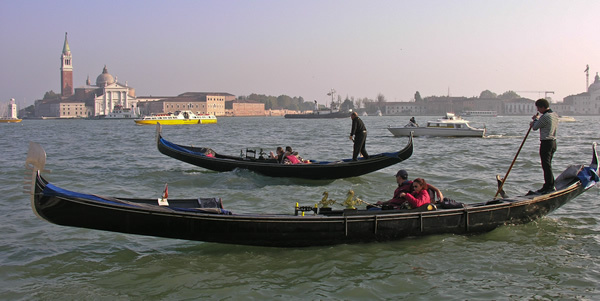 Make absolutely sure you agree upon the price and the duration of the trip before you step into the boat, write it down, and go by your watch (strangely, the gondoliers' often run fast). 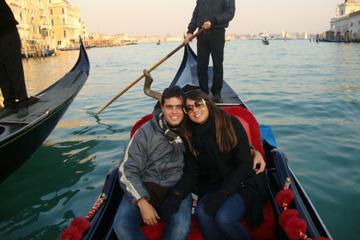 Venice's gondolas and gondoliers are regulated by the Ente Gondola (tel. 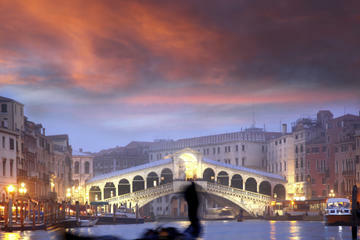 +39-041-528-5075; www.gondolavenezia.it), so call if you have any questions or complaints. The official rates if you're using a gondola as a taxi are €80 ($104) for up to 6 people for a 40-minute ride; additional 20 minute increments cost €40 ($52). After 7pm, the price rises to €100 ($130) for 40 minutes, €50 ($65) each additional 20 minutes. 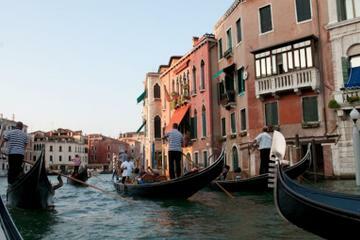 However, if you come across any gondoliere that actually sticks even remotely by those official rates, get his name and write me about it, because a reasonably priced gondola ride is a Venetian rarity I've just got to see. 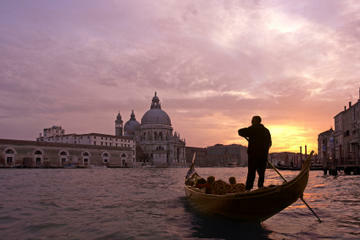 Or go the other way and see Venice by Private Gondola. You can get a cheaper ride by sharing the boat with other tourists. 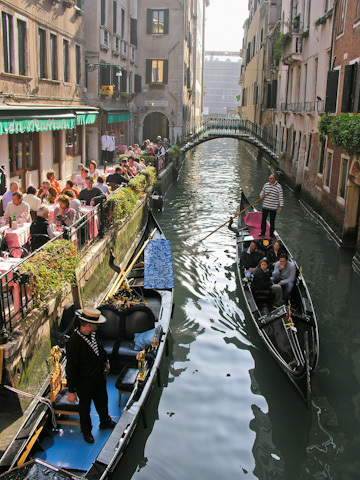 Just book via our partners either the 35-minute Venice Gondola Ride and Serenade ($59.53), the strangely popular Venice Gondola Ride and Serenade with Dinner ($115.57), or the best deal: a Venice Walking Tour and Gondola Ride ($53.07). You can get a cheaper ride by sharing the boat with other tourists. 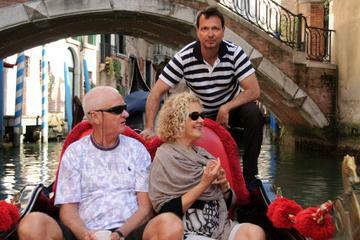 Just book via our partners Viator.com either the 35-minute Venice Gondola Ride and Serenade ($59.14), the strangely popular Venice Gondola Ride and Serenade with Dinner ($115.57), or the best deal: a Venice Walking Tour and Gondola Ride ($53.07). Remember: evening rides are more romantic, but cost a premium. Cheapskates will want to take their gondola spin before 7pm. All gondoliers will want to row you in a big circle back to where you boarded. If you want to end up elsewhere, insist upon it—firmly but politely.